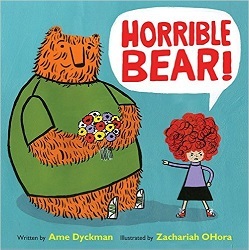 ﻿ Sonderbooks Book Review of Horrible Bear! Review posted February 10, 2017. Little, Brown and Company, New York, 2016. 36 pages. I confess: I’m a big fan of Zachariah OHora’s exuberant illustrations. They’re just right for this book. A little girl with a wild mop of curly red hair is flying a kite. (I like the way the front end papers are filled with her hair and the back end papers are filled with the furry top of the bear’s head.) The kite flying is shown silently on the title page. If you look closely, you notice the string has just snapped. The kite is next to a mountain with an open doorway near the top and a welcome mat. On the next page, the text just reads, “A girl peeked into bear’s cave.” The pictures show us that the kite has entered the cave and is sitting on top of a sleeping bear lying in the middle of the floor with a pillow. The next page says, “She reached – but he rolled.” And we see the kite go “Crunch!” beneath the bear. That’s when the drama begins. HORRIBLE BEAR! the girl shouted. She goes stomping off, continuing to shout about the horrible bear. Then the bear gets angry in his turn. After all, SHE barged in! SHE made a ruckus! SHE woke him up! Then he gets a horrible bear idea to show her what it feels like. Meanwhile, in her house, the girl, still angry, accidentally tears the ear off of her stuffy. She didn’t mean to! And that’s when she realizes maybe the bear didn’t mean to be horrible. But the bear is practicing to show the girl how it feels. He comes stomping down the mountain. When the girl meets him with an apology and tears, the situation takes a whole new flavor. This book is a child-sized look at anger and apology and accidental wrongs. That it involves a bear wearing a “Froggy Hollow Summer Camp” t-shirt and sneakers makes it all the more accessible. I love the way the two come up with Sweet Bear ideas at the end, with an acknowledgement that the Sweetness may not last forever. There are lots of points of discussion with small readers in this book. And those exuberant Zachariah OHora illustrations! The Horrible Bear has as much giant-sized gentleness combined with ferocity as Nilson in No Fits, Nilson! I also love some clever details in the illustrations – a copy of Wolfie the Bunny in the girl’s room, and then a book called Goldilocks that she kicks. In the bear’s cave, we see a stack of books with titles, Blueberries, The Goldilocks Myth, and 1000 Ways to Cook Porridge. And I just noticed for the first time that the back cover of the book shows the bear riding happily on the little girl’s purple bike with his friend the bat (animal, not baseball) in the basket.